I love fish! It’s high in protein and healthy fat, and it’s also really tasty. I also love big, hearty soups and chowders. This recipe ticks all those boxes but, as an added benefit, it’s also gluten AND dairy-free! This makes it especially suitable for anyone with the two most common food allergies. Despite being dairy-free, it’s still rich and creamy and delicious. It’s also super-easy to make, and you can throw all the ingredients in a pot and leave it alone for most of the cooking time. This makes it an ideal dish for servings to friends so that you don’t have to spend the whole time in the kitchen. Simply combine all the ingredients in a large pot and then put over a medium heat. Bring to the boil and then simmer for about an hour. 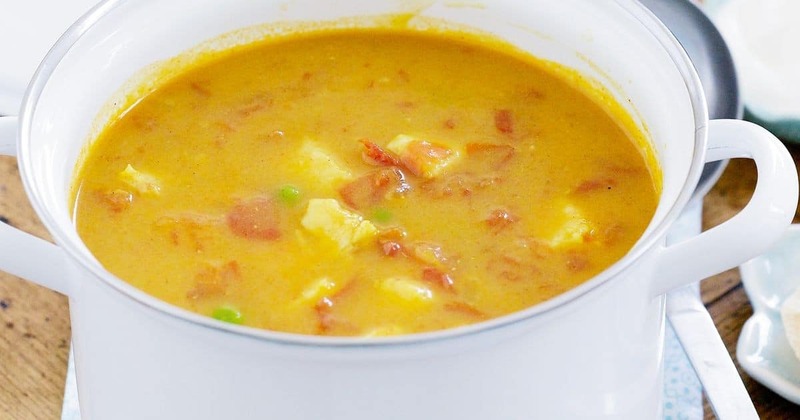 Stir periodically and then serve when the mixture reaches a chowder-like consistency. Serve with gluten-free crackers or bread. All my gluten-free ideas are organised so you can easily find what you need. Forget processed or junk food, there is no better and healthier way to lose weight than homemade meals. Find more recipes here.